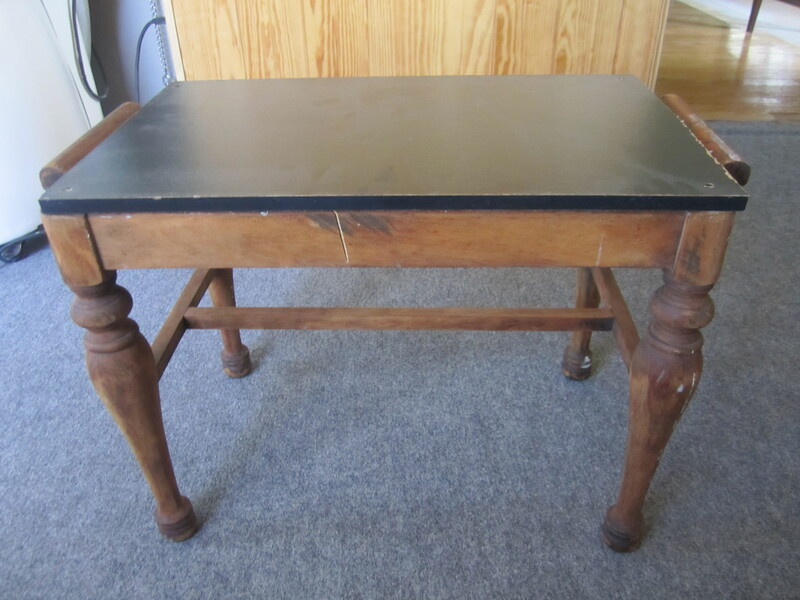 3 little dresses, a piggly bench and a mirror 175 years old. Sounds a bit like the makings of a fairy tale. To start with the little dresses are gifts for my precious granddaughters Brooklynne & Kennley and their soon to arrive sister, Morgann. As a “retired” interior designer I have boxes (and boxes!) 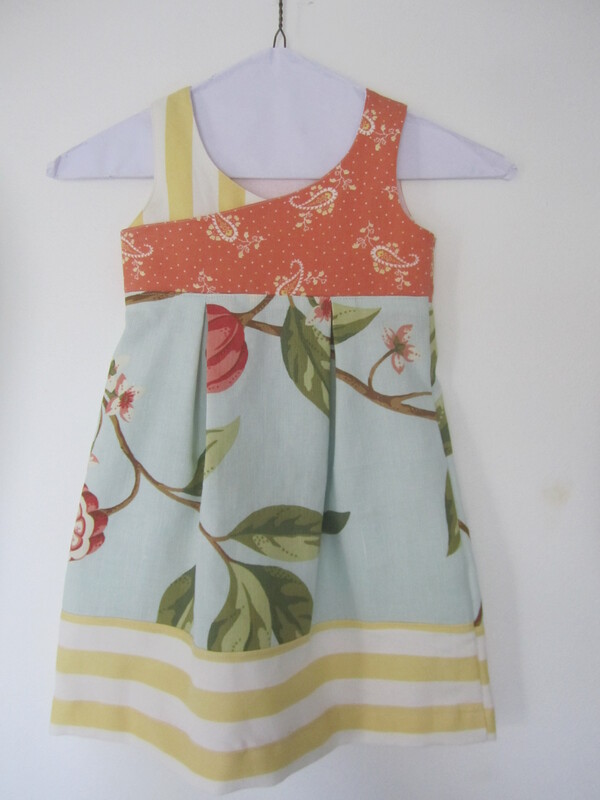 of beautiful designer fabrics and decided to sew up a few dresses for the girls. I’ve noticed more and more the crossover between fashion and home decor and a lot of little girls seem to be wearing patterns usually reserved for window treatments & bedding. While looking for pattern ideas I came across this little gem: http://nightowlsmenagerie.com/pdf/TheGoodDeedsDressPatternbyElysium.pdf designed for personal use only, especially to make for charity. I modified it a bit for the fabrics I planned to use. Also adding the lined bodice that was mentioned on their blog. Piping the edges would have been a lot easier, but I like the way these turned out. 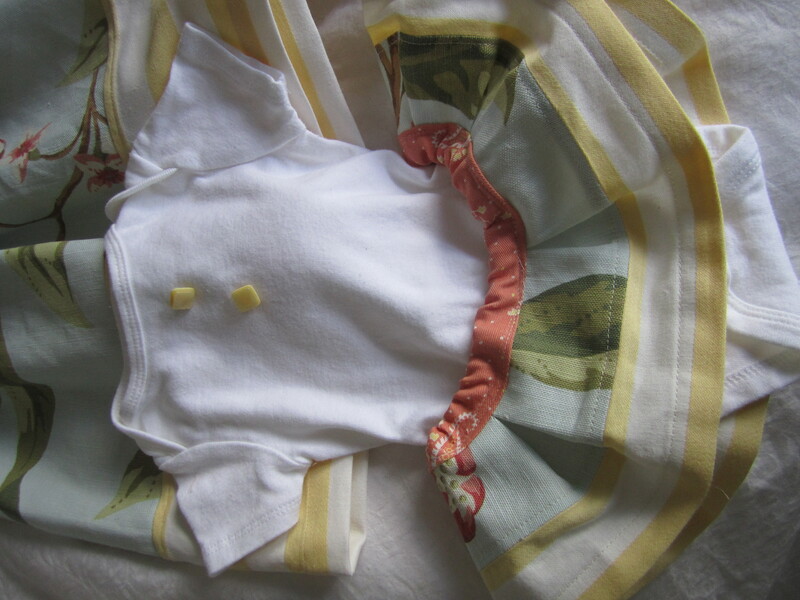 Then I made a small pleated skirt and attached it to a onesie for the baby. 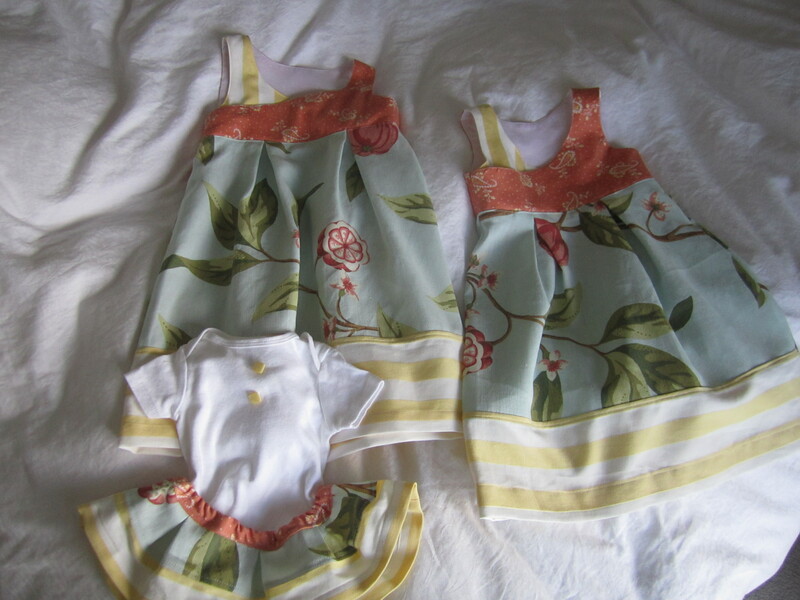 Baby Morgann will match her big sisters! The dress pattern was easy to follow and once I’m sure that the sizes fit I’ll be making more. What designers do with their leftover fabrics! 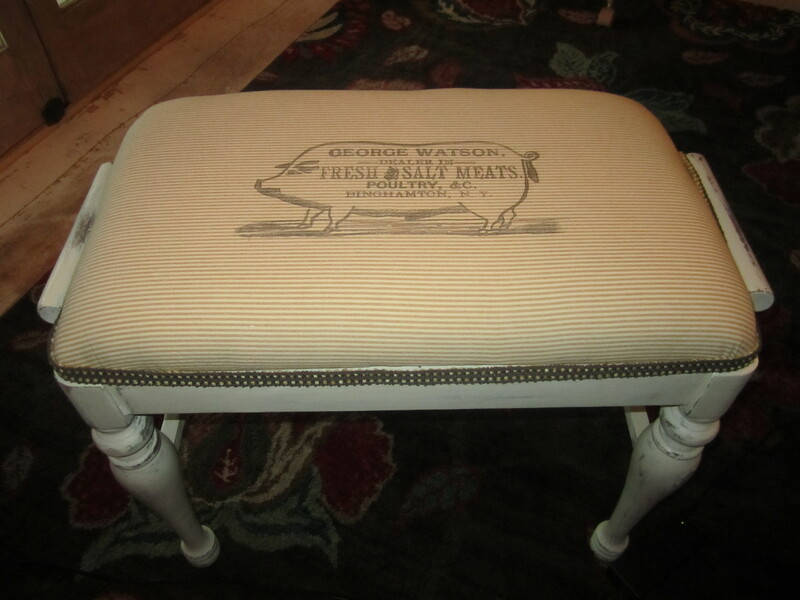 So on to the piggly bench…it started with a $2.00 garage sale find. It was obvious that the horrendous black presswood top had to go! 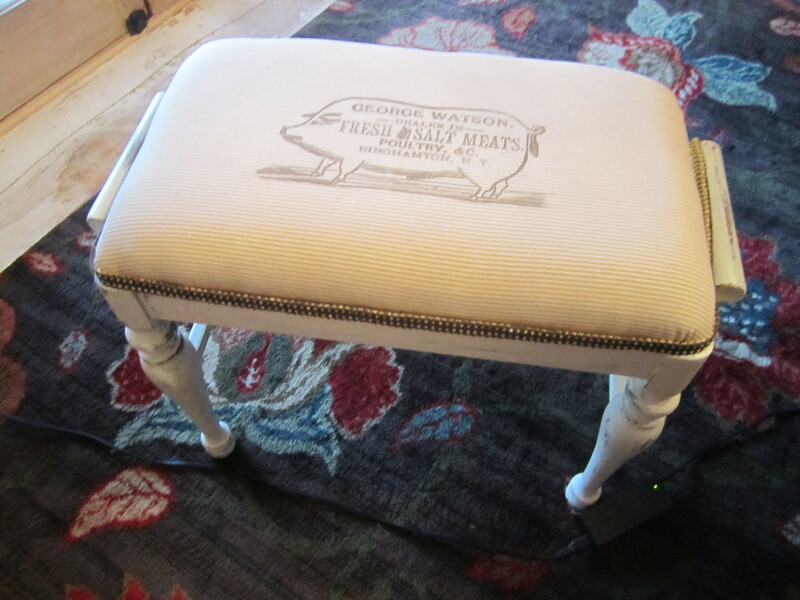 I removed the top, measured & cut a piece of 1/4″ oak plywood to fit, along with a piece of 3″ upholstery foam. Onto the decision to refinish, or not. 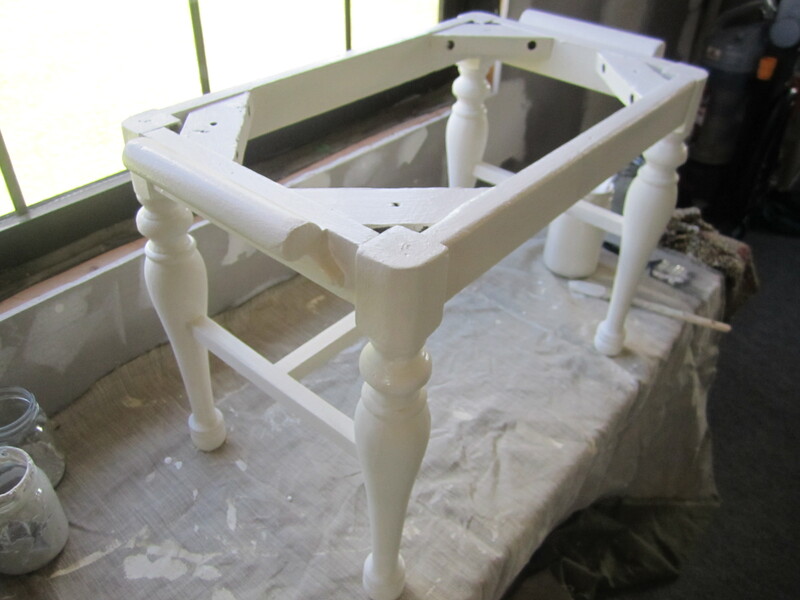 Lately I’ve read about the new chalk paint craze. I considered ordering some of the Annie Sloan chalk paint, but we don’t have a local supplier and I’m the kind of DIY crafter that likes to strike while the inspirational iron is hot. If I don’t have the supplies on hand, I get distracted, or lose interest. You’d have to see my craft area to believe all of the “in process” projects I have. So I searched for a homemade version. I used about 3 cups of flat latex with 1 cup of lime….just the normal garden kind. I’ve read a lot of recipes using unsanded grout, but didn’t have any on hand. The lime worked fine. I mixed it with a little water first, and then added it to the paint. 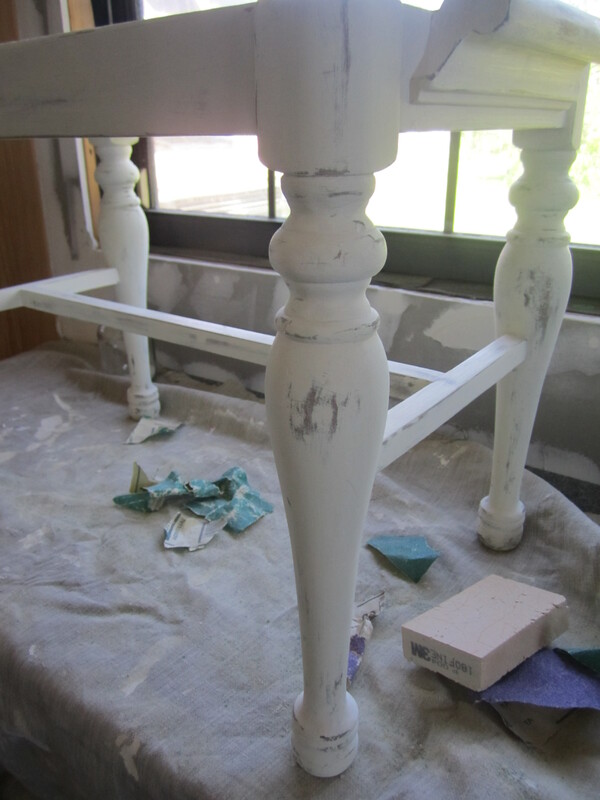 It went on smoothly, dried with a rough, salty texture which easily sanded off. I used a coarse sandpaper block to distress a few spots. Then I finished with a coat of paste wax. The result was wonderful! 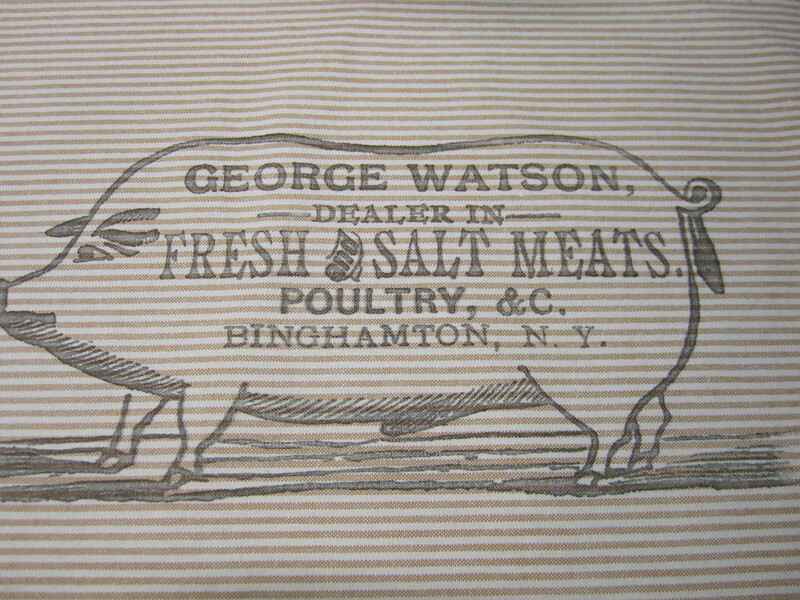 Next I found an old advertising image of a pig, from a butcher shop in Binghamton, NY from http://graphicsfairy.blogspot.com Using a method which involves copying the image onto freezer paper and then burnishing it on to fabric. Here are the instructions:http://home-frosting.blogspot.com/2011/08/transfer-using-freezer-paper.html It took me a few practice attempts, but once I got the hang of it, the results were great. It’s definitely a method I will use again. 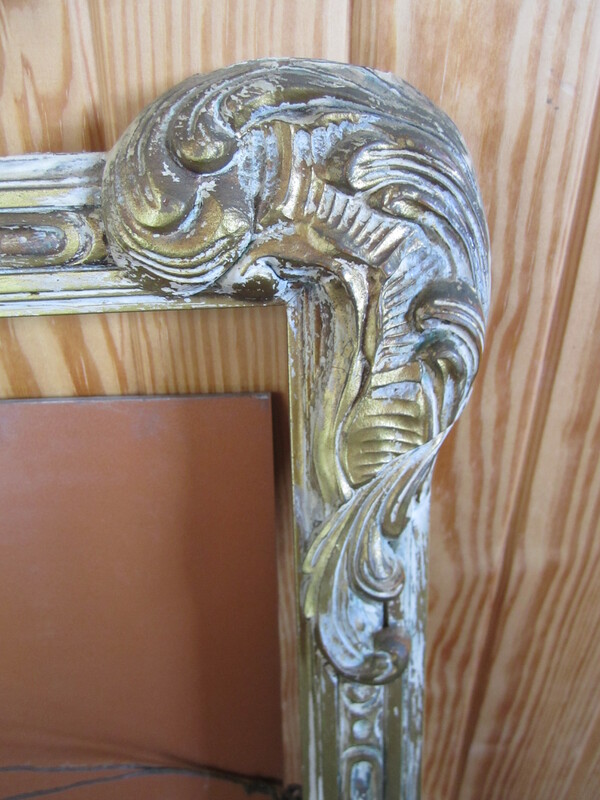 Now, about that 175 year old mirror…I used the same “chalky” paint to redo cabinets in the hall bathroom. At the same time we removed this large, outdated wooden medicine curio cabinet thingy. I went to our local Habitat Restore, looking for a wooden mirror, or an interesting frame that I could paint to match the cabinets. What I found were 2 mirrors. 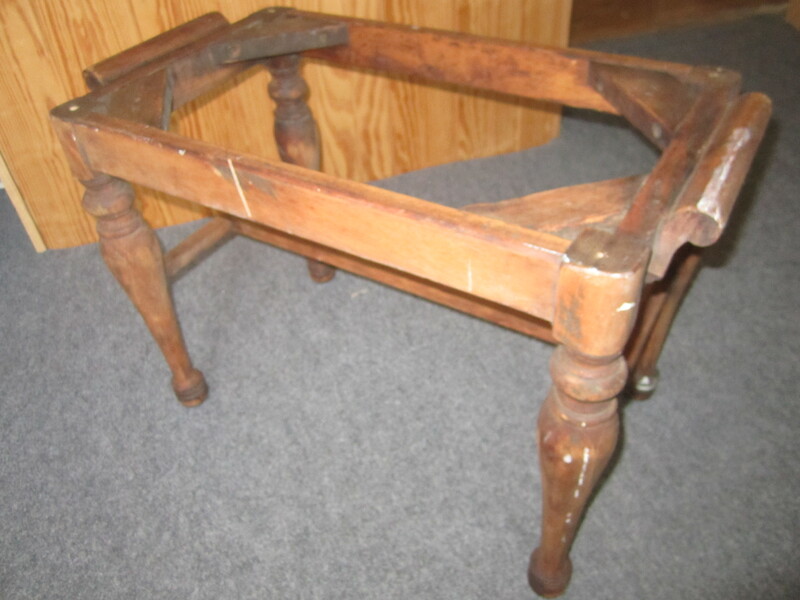 One was a simple square, heavy maple for $5.oo, the other was more ornate, and a little too small for the vanity. It was obviously old, and very interesting and only $8.00. I decided to purchase them both and was delighted that it was 10% off day! Thats right! $4.50 for the square and $7.20 for the ornate. 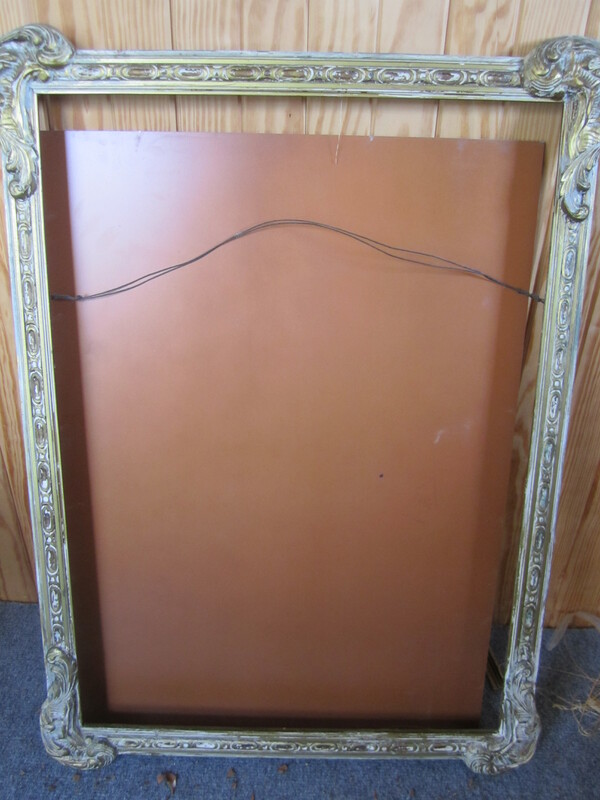 When I got them home I took the ornate mirror apart. 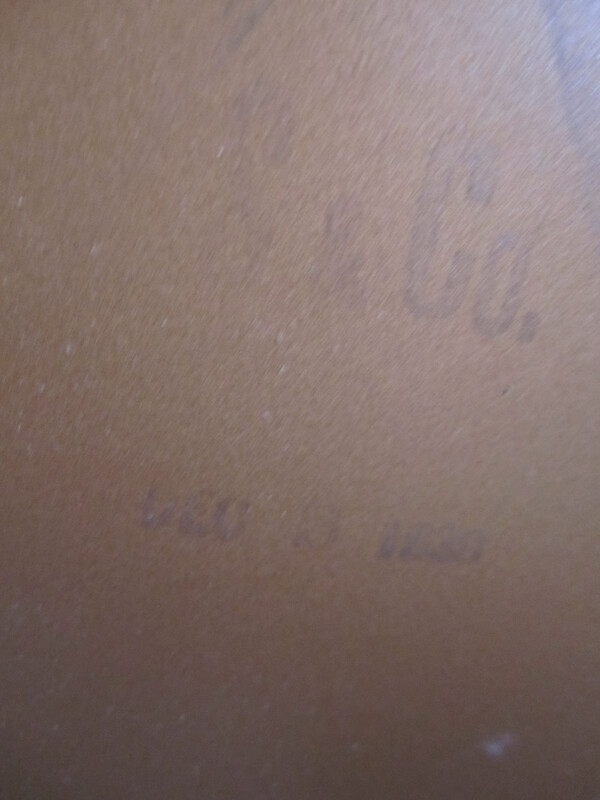 The backing had water damage, and some of the nails were rusted. There was a small spot of mirror silver missing and I was interested to see what was underneath the layers and hoped to determine the approximate age by getting a better look at the construction and materials. Too small & ornate for our bath, but worth the purchase! Seems like a fairy tale ending to me! Maybe it’s the rainy afternoon making me wax nostalgic, or the fact that we’re leaving for vacation soon and I’m trying to clean out the fridge/pantry/produce bins before we leave. Regardless, I had a few apples to use and considered turnovers and then the epiphany…a childhood favorite…Apple Fritters. While I was growing up, my father traveled a bit for work. During his trips my otherwise “June Cleaver” mom would relax her kitchen standards. 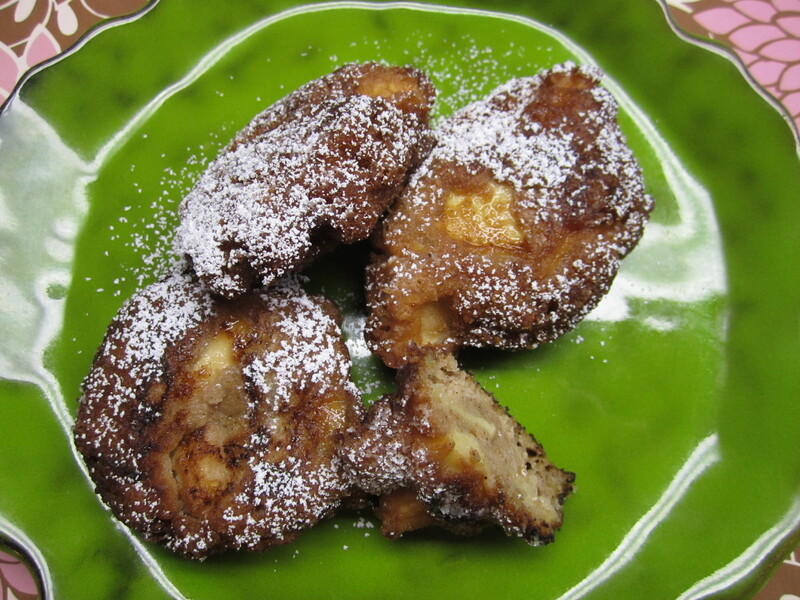 We would enjoy scrambled egg sandwiches for dinner, or the elusive Salisbury Steak TV dinner (it was the 70’s after all), but the real treat, especially when we were really missing dad, was apple fritters FOR DINNER. So tonight, I pulled out the tattered index card she gave me with the recipe typed on her old manual typewriter. The results were as sweet as my memories. Mix together dry ingredients in a med bowl. In a measuring cup whisk together wet ingredients. Slowly add to bowl. Carefully fold in apples. 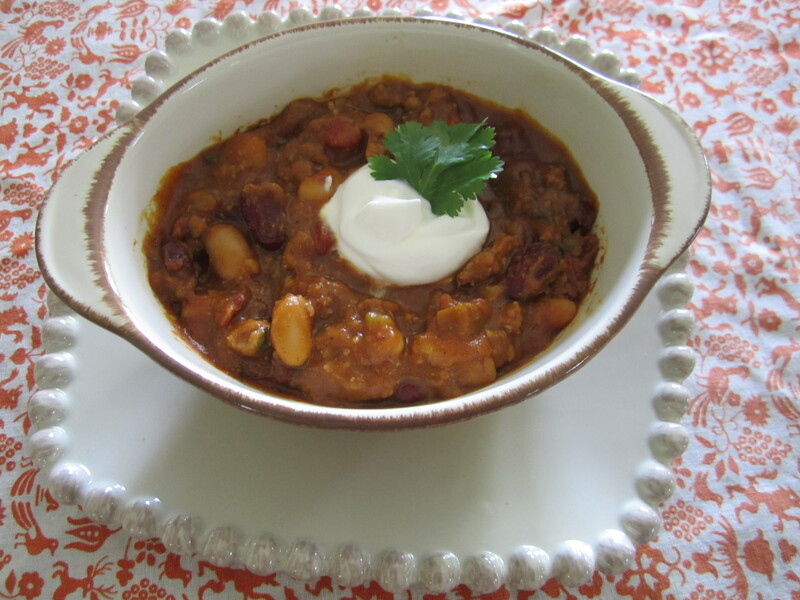 Heat oil in a cast iron skillet or Dutch oven. Oil is ready when a test drop of dough floats to the top. Using a soup spoon, place several dollops of dough into the oil. Watch closely for the underside to turn golden brown, then gently flip over and continue frying until done. Transfer to a paper towel lined plate, and sprinkle with confectioners’ sugar. Our dog, Hooch, is becoming a fussy eater in his advancing age. Ironic, as when he was a pup he ate EVERYTHING. You name it…clothes, drapery, doors, even an entire bedroom carpet. Not to mention the time he devoured the interior of my car. So it’s surprising and a little disheartening that he doesn’t have much of an appetite now. The one thing he does like is “Treats” I’m not sure if it’s the actual food that he enjoys, or if he’s accustomed that the word “treats” equals a reward for some type of good behavior. He does a few tricks, like “sit” and “give me paw”, but most frequently he gets a treat for accompanying me to the garden and staying by my side instead of running off as was his former habit. Now as we’re returning to the house I pet him and tell him he was a good boy and say “treat?” He trots to the porch and waits at the back door until I catch up, then wags his tail as I pull a treat out of the cabinet. Yesterday, I was examining the bag of Chicken treats that I bought at a local health food store. They are made in China. That just makes me uncomfortable. 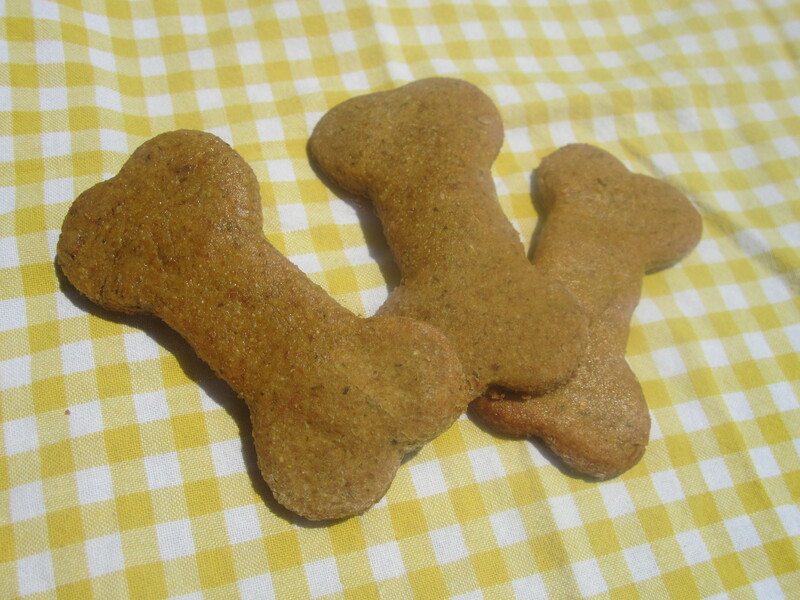 I don’t buy groceries for my family that are produced in China and so I determined that I would be baking a batch of homemade healthy treats for our furry kid, hoping that in the process I could pack them full of nutrition. Apparently, it worked! Hooch was hovering around the kitchen the whole time I was baking and gobbled down 4 of them as soon as they were cool. He keeps returning to the kitchen looking longingly at the counter where the latest batch is cooling. 1 c fresh or frozen green vegetable, I used broccoli. Green beans would also be a good choice. Pulverize wet ingredients in food processor. Add dry ingredients. Add flour as needed for consistency. Dough should be stiff, not sticky. Refrigerate dough for 20 minutes. Divide dough in half, keeping remaining half refrigerated until use (or freeze for later use). Using floured hands, shape dough into a ball, kneading in flour until smooth. Roll out dough on flour covered surface to ¼” thickness. Cut out bone shapes using a cookie cutter, or use a pizza wheel or pastry cutter for geometric shapes. Place on lightly greased cookie sheet. Bake for 20 minutes. Makes approx. 4-5 dozen. Passing a church marquee, I saw the words: “Sacrifice small gifts of surrender”. This particular church was promoting the tradition of giving up something for the Lent season. At first I was reminded of the verse where Samuel asked if the Lord delighted in burnt offerings and sacrifices as much as obeying His voice. He concluded, “To obey is better than sacrifice” (1 Sam 15:22b). But when thinking of sacrificing surrender, it takes on a whole new meaning. What can I surrender as a sacrificial gift to God? Can I surrender the hopes I have for my children; my plans and dreams for the future; my gifts and talents? Even more so, what about surrendering struggles and trials? Can I offer their release as a gift? My friend Susie has had breast cancer 3 times. She has the most amazing outlook and refers to her disease as “the gift of cancer”. I know she recognizes that God is sovereign and in complete control, perhaps that’s why she was able to give her cancer back to Him as a gift. Are there troubles and challenges you are experiencing? Financial worries, health issues, addictions, family concerns? Can you believe that God allowed them in your life for good? “For I know the plans I have for you, declares the Lord, plans to prosper you and not to harm you, plans to give you hope and a future”(Jer 29:11). Can you thank Him for the gift of the pain you are experiencing? Can you offer not only your acceptance, but can you sacrifice it as a gift of complete surrender to His plan and purpose? We’re camping enthusiasts…have been for a long time…began with carrying tents and minimal supplies on the back of our motorcycles. We’ve graduated to a motor home named Peggy. She’s a 27′ Class C affectionately dubbed “The Love Shack”. Quite simply because we love everything about traveling together in Peggy. It’s all good. She’s a work in progress and we enjoy talking about the places we will see and the way we will adapt the space to our needs & tastes. This brings to mind a Bible passage I was reading in Numbers about the children of Israel as they followed the cloud above the tabernacle. Sometimes the cloud would settle in overhead and they would camp…sometimes for days…sometimes weeks, and on occasion just overnight. Now being a camper, I know the change that takes place when you think you’re going to stay put for a while. You unpack. You settle in. You set up the canopy and pull out the chairs. In other words, you get comfortable. God didn’t give them the information about how long they were going to stay. He didn’t forewarn them they would be leaving the next day. The passage says “When ever the cloud was taken up, they would journey” Num 9:22. They didn’t get comfortable. Maybe the lesson is to remember our time in any place is short. Today may be the only day we have to make a difference in the lives of those around us. Or maybe God’s plan is to set us on a journey that will cause us to leave the comfort of our camp. Either way, just as the children of Israel experienced, it’s about following His command. “At the command of the Lord they remained encamped, and at the command of the Lord they journeyed.” Num 9:23. Hip Hip Hooray! On my way to a happier life. So, I’ve been working this corporate shtick for the last year and have lost the very essence of Donna-ness. No problem, right? Just decide the path, and make the changes! That’s what I’m doing! Yesterday I leased space at Beach Street Antiques and I am on my way! Once I’m rolling, I will spend my days scouring yard & estate sales, used junk shops, and crafting my fingers to the bone! I am so excited. Stay posted for photos of recent treasure finds! Say it’s not true! This week has been an exercise, navigating Excel reports, looking for patterns in production (or lack thereof). But in the midst of it, I had a creative project that I committed to have complete by tomorrow. So, it was off to Michaels and a local consignment shop to get materials. We have a Mid Century modern dining set at the store that I need to decorate for the holidays. In addition, I had to make a ‘ballot box’. Easy enough. I found a glossy red shoe box. I covered the bottom half with a coordinating Christmas paper to cover the information sticker, then I used some Modge Podge and glossy dimensional paint on the lid. Making a HUGE bow with my Bowdabra…couldn’t live without it…and Voila I am inhabiting my creative self once again! I am loving my evening. The house is all mine, and I’m working away in the kitchen. What’s Cooking? Just took a pot of White Chocolate Rice Pudding off of the stove to set for a bit. I have some beautiful brown Willow House ramekins that I’m going to use for serving. While it cools I am working on the Merlot Cherry Sauce. Afterwards some prep work for a Corn Souffle I’ll assemble tomorrow. Tomorrow I am spending Thanksgiving with my sister, Laurie & her husband Mike. 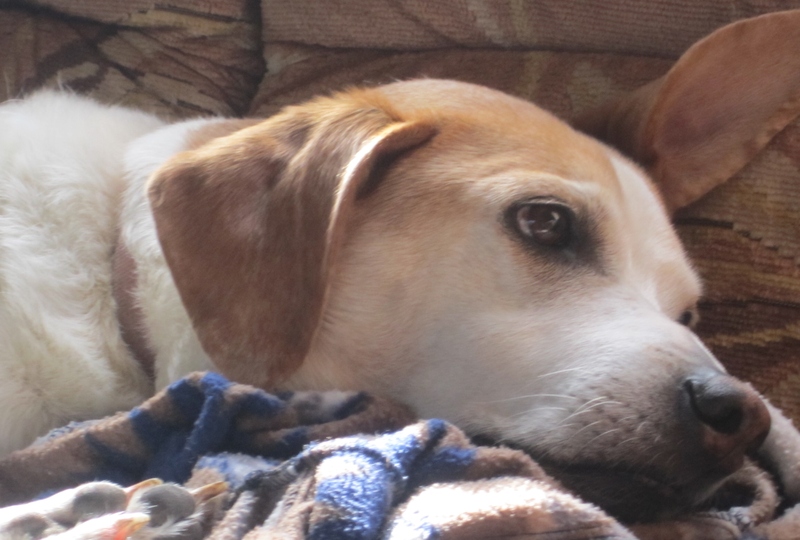 She’s promised me homemade quiche for breakfast as an incentive to get up early and head to her house. I’ll definitely take her up on the offer. In addition to the Corn Souffle & Desert, I’m in charge of the wine. We’re going to start out with Dom Bertiol Proseco to accompany some brie & phyllo appetizers. (We might pair this with the quiche if I get there in time!) For conversation & cooking we are both Cab lovers so the choices are ’07 Starmont and my new friend “Decoy”. Dinner we’re going BIG Tuscan, ’06 Masi Campofiorin and at the end of it all serving Jackson Triggs Vidal Icewine, Proprietors Reserve with the rice pudding. I’m looking forward to a relaxing day, and so thankful to be spending it with my sister.